Secretary of State Mike Pompeo is returning to the Middle East to again push for action against Iran, his chief foreign policy foe. But the message of this trip, his second to the region this year, will find three very different audiences, likely with varying degrees of acceptance. In Israel, Pompeo will embrace Prime Minister Benjamin Netanyahu, a close ally in the Trump administration's campaign to push back on Iranian influence. In Kuwait, he will press the Amir and other leaders for unity among Gulf Arab countries against Iran. And in Lebanon, he will urge leaders, including those with close ties to Hezbollah, to "disconnect" from the group and its supporter Iran -- a tall order as the group now controls cabinet posts in the country's government. The stop in Israel has raised some eyebrows not because of the message but for its proximity to the nation's upcoming elections. With just three weeks to go, critics say the trip is all but an endorsement of an embattled Netanyahu, facing a tough re-election fight amid possible criminal charges of bribery and fraud. While Netanyahu has even used sound bites from President Donald Trump in his campaign videos, the State Department has repeatedly pushed back, saying Pompeo's visit is strictly for the sake of the U.S.-Israeli alliance. "There's always an election. 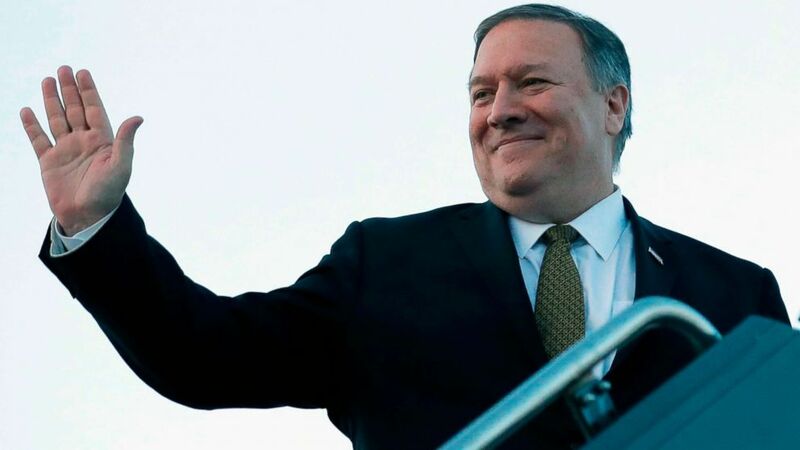 We've got an election a year away, and they've got one that's less than a month away," Pompeo said Monday, en route to the region. "I'm going to Israel because of the important relationship we have." Still, there are rumors that Pompeo may make an announcement, with opposition figures expressing concern the administration could recognize Israeli sovereignty of the Golan Heights. That's been fueled by a State Department decision last week to remove the term "occupied" when referring to the Golan Heights and West Bank in its annual human rights report. While a senior official said last week it did not convey a change in position and downplayed the change in language, Pompeo said Monday that it "reflects the facts as we understand them." "This was a factual statement about how we observe the situation, and we think it's very accurate, and we stand behind it," he added. Pompeo will not be meeting with any Palestinian leadership during his visit. It's unclear if the U.S. reached out, but Pompeo indicated the Palestinians did not "want to talk to us." Trump's son-in-law and senior adviser Jared Kushner has led the development of the administration's secretive Israeli-Palestinian peace plan, which Pompeo said will begin to be rolled out at the "right time." Iran's presence is strong in Lebanon, where Hezbollah, the Shia Islamist movement that the U.S. has designated a foreign terrorist organization, is a bona fide political party and now controls three cabinet positions, including the Health Ministry with its enormous budget. Pompeo will not meet with any Hezbollah-affiliated officials, according to a senior State Department official, but he will meet with President Michel Aoun and Minister of Foreign Affairs Gebran Bassil, both of whom helped broker Hezbollah's power-sharing roles in the government. There, the task Pompeo has laid out is difficult at best -- to "disconnect" the government from its Hezbollah ties. When asked by reporters how he would do so, he said only, "In my business we talk to a lot of people that we're hoping to change their way." One way the U.S. may ramp up the pressure on Lebanon to do that could be through economic pressure. The U.S. has warned of sanctions against Lebanese government agencies if funds from the U.S. or international community make their way into Hezbollah hands. Pompeo will also push Lebanon to keep its financial institutions and banking system free of Hezbollah funds, according to the State Department, which declined to preview any sanctions or other announcements. Pompeo's first stop will be in Kuwait, the small, oil-rich U.S. partner on the tip of the Persian Gulf, where he will co-host a strategic dialogue meant to signify the importance of American-Kuwaiti relations. But he'll also have tough work cut out for him there, in particular trying to bolster Kuwait's drive to reunify the other Gulf Cooperation Council countries that have been divided for nearly two years between Qatar and the Saudi Arabia and United Arab Emirates-led bloc that split with it and imposed a blockade. The U.S. has said for months that the two sides need to repair relations, with the rift dangerous for security and ripe to give Iran an opening. But instead, each side has doubled down, and the problem has become so intractable that earlier this year the Trump administration's special envoy for the crisis quit. It's unclear how optimistic Pompeo is about making headway there, but he will also be advocating for the new Middle East Security Alliance, a U.S.-backed alliance of Gulf countries with Egypt and Jordan meant by the Trump administration to be a united front against Iran. While it's made some headway in getting off the ground, it's still marked by internal disputes and an vague, broad mission.